Welcome to another edition of the Team Santa Inc. News Daily. Today, we are going to look at the development of unbreakable shatterproof ornaments. Plastic Christmas ornaments that are perfect for commercial type applications, such as government buildings or other commercial type property, where you want to use products that are completely safe and won’t cause harm to passersby. A huge selection doesn’t hurt either.‎ Thousands of styles to choose from and the colors are absolutely gorgeous. You must come by to see for yourself. 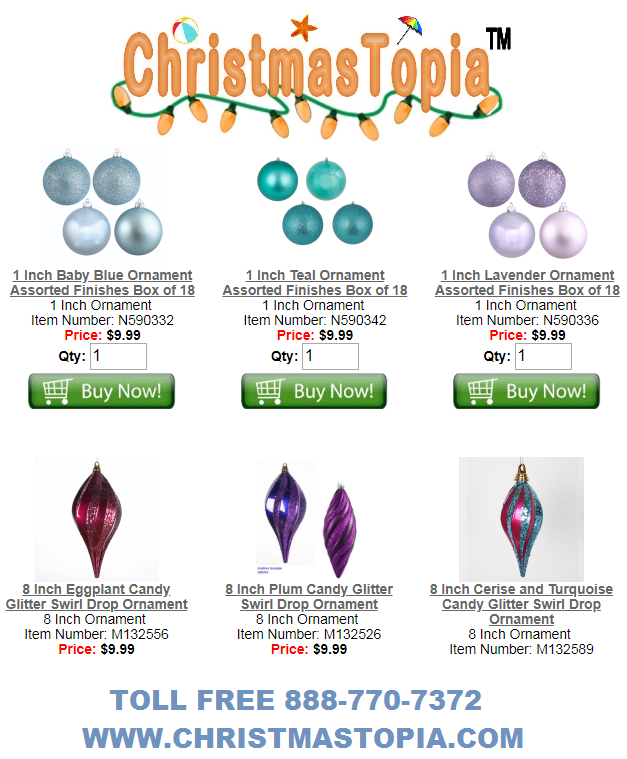 Our most popular sellers are always our 8″ – 10″ and even 12 inch solid color unbreakable plastic ornaments. Ideal for most any type display. All year round, these ornaments are great for large Christmas trees where there is concern for safety. The fact that they are shatterproof makes them so appealing because they won’t break in somebody’s ‎ hand. Another feature of these shatterproof plastic ornaments is the huge selection. Not only round ornaments, but all different shapes, colors, sizes and designs. The best part is that these unbreakable, shatterproof Christmas ornaments look more like glass than the real thing. Old fashioned glass Christmas ornaments are still available, but because the plastic looks like glass and it won’t shatter. The glass manufacturers have become plastic manufacturers. Of course you can still purchase old world glass ornaments,the trend is definitely moving in the direction of the new shatterproof plastic ornaments. Come by a see the selection for yourself. Help @ Team Santa Inc.